Bought Ur-Energy stock in 2017, as a way to profit from what I saw then as a uranium market turnaround. Uranium spot market did put in a permanent bottom in late 2016, making Ur-Energy a profitable investment so far. With solid financial results as well as seemingly good prospects for further uranium market price strength, this stock has the potential to experience further solid gains going forward. It now looks more and more likely that my call for a uranium spot price market bottom at the end of 2016 was correct. I invested in 2017 and 2018 accordingly, buying Ur-Energy (URG) and Cameco (CCJ) stock, and thus far, I am satisfied with both investments. Ur-Energy stock was lagging behind Cameco until recently in my portfolio, but it is now all caught up and I do believe it has the potential to outperform going forward. A combination of wise contracting as well as a number of projects with strong economically-sound production potential make it one of the best-positioned companies to be invested in if one wants to bet on a continued long-term uranium market revival. As I already pointed out, the uranium spot market experienced a bottom in late 2016, which holds to this day. At the root of this early stage recovery is seemingly a shift in the supply/demand balance. Uranium was on a sliding path for a decade, starting in 2006, because a price spike led to countless new projects as well as the expansion of old mine capacities, which once were started, they were always going to enter production in order to recover sunk costs. But with the low prices we have been experiencing in the past few years, it goes without saying that new capacity addition projects became undesirable. As a consequence, we shifted into a new period where uranium consumers, mostly utilities are facing uncovered shortfalls, according to Cameco. As we can see, there is a widening gap between needs that have been contracted for and needs that are yet to be met. Part of it is to be expected, of course, because after all, the further we go forward in time, the less likely it is for utilities to have made their uranium supply plans. 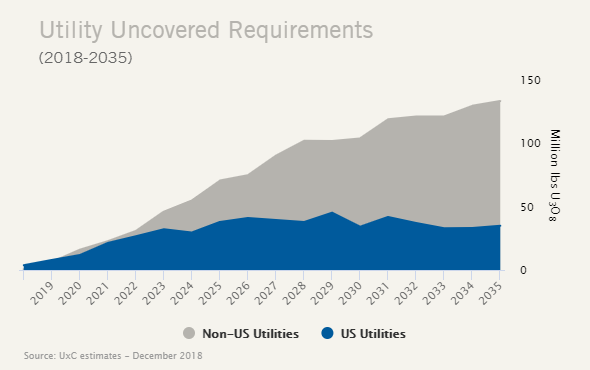 But, as the chart suggests, even in the next few years, we have a gap, meaning that there are utilities out there which have not been buying and contracting enough to meet their shorter-term needs. Even though it is now increasingly clear that Germany is likely to retire its nuclear power generation capacity, now that the Nord Stream 2 gas pipeline seems to be a done deal, even if it will face some delays, reality remains that nuclear power capacity is still expanding worldwide and it is happening at a healthy pace. Germany retired eight of its seventeen reactors since the nuclear disaster in Japan in 2011 and is set to retire the rest by 2022. 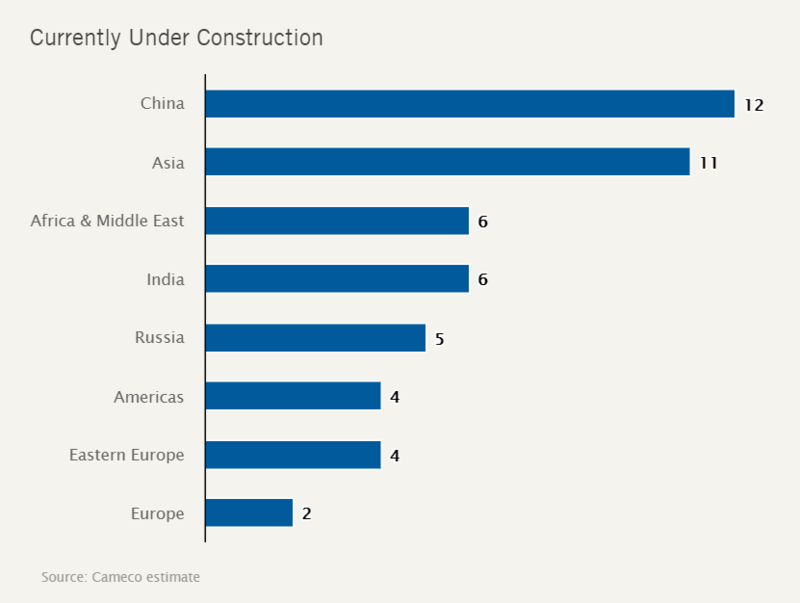 As we can see, however, China alone is set to build more reactors than the nine that Germany still has to retire in coming years. Even though other countries such as France also suggested that they may go down the road of decommissioning some nuclear power, it seems that such plans need to go on hold, given the public mood which does not support the necessary financial sacrifice to fund wind & solar as a replacement. The Yellow Vest protests of the past four months, which rocked most French cities, were mostly triggered by a middle-class rebellion against rising energy prices. 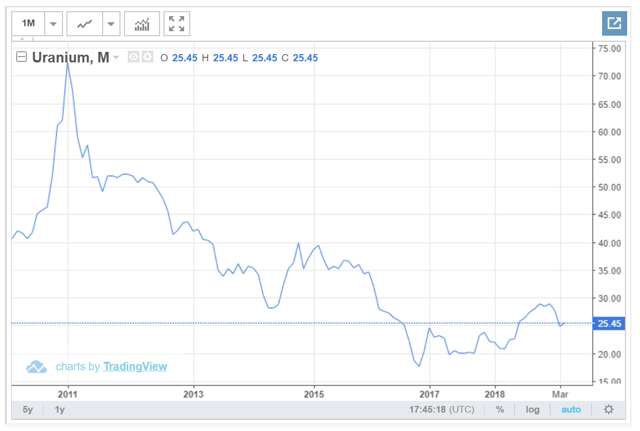 Most current indications are that mined uranium supplies will have to be increased, which is why prices have been trending up for the past few years. It will most likely take a significantly greater increase in prices in order to trigger the necessary increase in investments to make it happen. We should also keep in mind that existing mines are also getting depleted, so higher prices would probably be needed just to keep production going at current levels. For the full year of 2018, Ur-Energy announced a net profit of $4.5 million on revenues of $23.5 million. It is a significant improvement in profitability, even as revenues declined significantly from $38.4 million in 2017. Profits were only $76,000 in 2017; therefore, it should come as no surprise that markets reacted very positively to the yearly report. The profit was achieved from a combination of contracting of mined uranium at a lower price than the price of sale as well as from its own mined production. It sold 480,000 pounds of uranium, while it produced 302,000, the rest being bought and sold, with Ur-Energy acting as an intermediary. 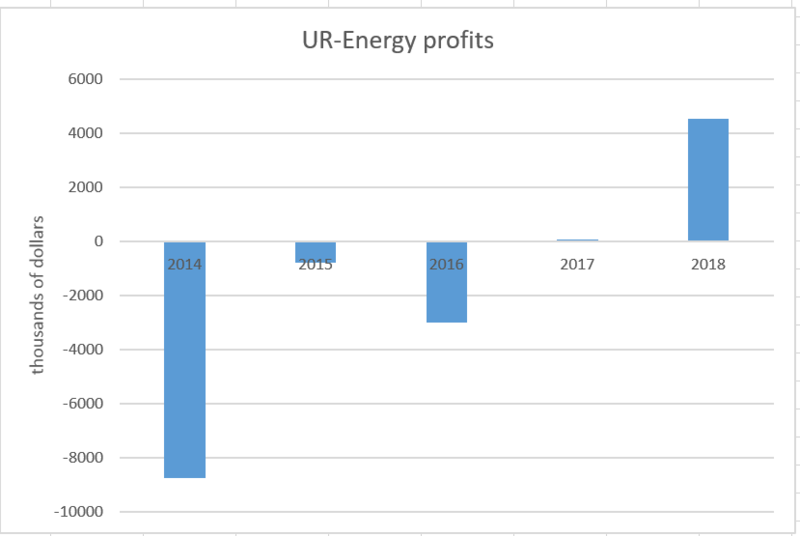 Ur-Energy plans to continue with this business model, which is giving it the ability to more or less hedge. If uranium prices increase, its mining operations will benefit. If, however, prices go down, it has already contracted to sell at a fixed price, so it can buy cheaper uranium and sell it at a higher price this year. So, while a dramatic increase in uranium prices may not have as great of a net impact on profits this year, any downturn will not necessarily lead to Ur-Energy swinging back into loss either. It is a model which brought this company out of a period of financial losses year after year, and for the first time in 2017, it broke even, while this year, it managed a healthy profit. We should keep in mind that uranium spot prices only bottomed at the end of 2016; therefore, 2017 was still not a very favorable year for uranium miners. Despite that, Ur-Energy managed to break even, which is, in my view, a testament to the fact that this is a solid company that one wants to be invested in as a way to bet on a uranium market bull market in the years ahead. It seems like a company that offers limited downside if the bet on improving uranium prospects turns out to be wrong, given that it has shown resilience during tough times for the uranium industry. If the bet on this uranium market turnaround continuing into the foreseeable future turns out to be right, Ur-Energy has the reserves and assets in place to boost mined production substantially. As I pointed out in my first article stating my intention to invest, it could easily quadruple production, which could potentially propel this stock much higher. Its Lost Creek mining site alone has the above-mentioned potential to produce substantially more. But Ur-Energy also has other sites with significant potential for reserves and production. At the same time, in case that the uranium market turnaround proves to be short-lived, this company has shown an ability to hunker down and minimize the impact of lower prices; therefore, the downside to investors is far less than the potential upside. While the downside risk needs to be considered, I continue to expect a significant gain from my investment in this stock. It may take a few more years before I will sell because I believe the gains we have seen recently are just the beginning. Disclosure: I am/we are long URG, CCJ. I wrote this article myself, and it expresses my own opinions. I am not receiving compensation for it (other than from Seeking Alpha). I have no business relationship with any company whose stock is mentioned in this article.